A little mosaic of the textures, flavours, colors and aromas that made my spring this year, and to fill in some gaps of what I was doing since the last posts… From the tangy flavours of green almonds, grapevine leaves and passion fruit, to the shivering and fuzzy texture of fava beans, loquat, green almonds and the salt of the Dead Sea, to the refined scent of orchards in bloom and rose gardens – this is a reminder of some of the many small delights that make our lives wonderful. Citrus blossom is the quintessential scent of spring in Israel. And if you think that it ends with orange blossoms, you are seriously mistaken. All citrus trees are in full bloom, and if the humming bees don’t waste their time to make honey from all the sweet & tart fragrant nectar, even more so the perfumer and fragrance enthusiast should not miss this fabulous season. I am surprised that the Middle East does not have a tradition of going out to the orchard to admire the blossoms, much like the Japanese admire their Sakura. The most fantastic thing about citrus blossoms is that the while their scent is distinctively floral, they are also reminiscent of the fruit to come. After all, the fruit is what will come out of the flowers! And as you can see in the pomelo blossom photo above, the little fruit are already starting to emerge. While Jerusalem is renowned for its ancient stones and holy history, it is much less known for its beautiful gardens. It is probably the most well gardened city in Israel, with an abundance of fragrant bushes, shrubs and trees and plenty of flower gardens that will not embarrass a British gardener. Here are just some of the gardens I have seen, all in the neighbourhoods of Yemin Moshe and Nahalat Shiva. The jasmine and pissosporum photos in the following post are also taken in the same gardens. There are so many types of jasmine, and while I haven’t seen many Jasmine grandiflorum or Sambac blooming this spring, a different variety that is totally new to me has captured my nose’s attention. It has a delicate aroma that is lightly peach-like, while being ultimately jasmine. The yellow jasmine is the least fragrant of all jasmine varieties, and is mostly appreciated for its colour. This evergreen bush was in full bloom everywhere I went in the cities. But it was especially fragrant in the gardens of Jerusalem, where its exceptional aroma, reminiscent of both orange blossom and jasmine scented the air with its uplifting and delicate scent. The scent of salt, seaweed, sand , sun-tan lotions, and the chocolate-banana ice-cream bars sold by merchants carrying iceboxes on their backs haven’t changed since I was 3 years old. The bathing season starts nice and early (if it ever ends! ), with the ultimate sensual feeling of freedom and carefree. The mud and the salt of the dead sea has a most peculiar scent from the abundance of minerals bubbling from the springs. Sulfur and salt stand out more than others. One needs to overcome the stench of rotting eggs and decide to become part of the mud and oily water in order to enjoy this peculiar scenery and open your own spa under the sky. Ripe, originally uploaded by Schröedinger's Cat. 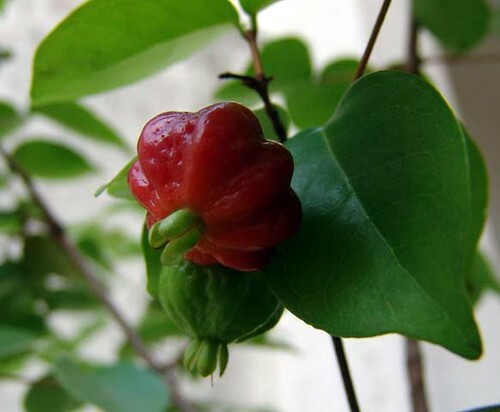 This tiny berry that grows on large bushes, has the shape of little red bell peppers, and a tart flavour with a peculiar aroma that is hard to explain. Like many other tropical fruit, it’s a love it or hate it one. I learned to love it. 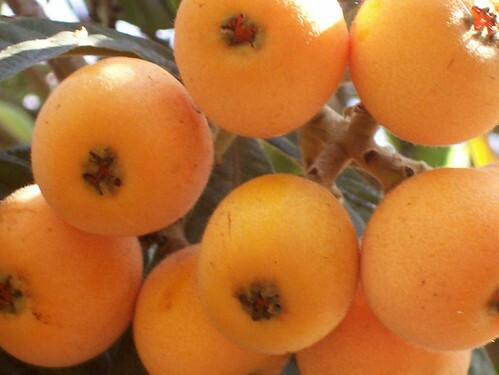 bunch of loquats, originally uploaded by Kaiki X. This fuzzy Japanese fruit is best eaten fresh from the tree (just like strawberries are best when just picked). By the time they get to the market, their very delicate and barely-there aroma is lost, but their mild sweetness and refreshing moisture is still a delight – not to mention the tactile experience of stripping the fruit bit by bit from its thin skin, just for the fun of it! (The skin is covered with a fuzzy plumage that can be rubbed, the peeling is not quite necessary). Passion, originally uploaded by Shooz. 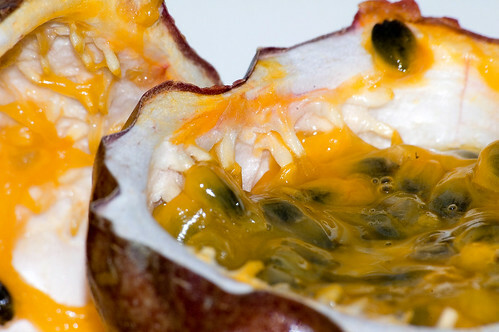 The purple and wrinkly shells of this wondrous fruit hold inside a slippery treasure of orange jelly and plentiful of black seeds, and is fragrant as much as it is tart. I have never seen so many passion fruits before in Israel. Their popularity has tremendously increased, and they are now moved from being an ephemeral garden specialty of few to the star of every juice and frozen yogurt bar. While grapevine leaves do not have a very distinctive scent, they have the most fantastic tangy flavour, and are used for the legendary stuffed grapevine leaves. Everything about making this classic specialty dish is sensual and relaxing. 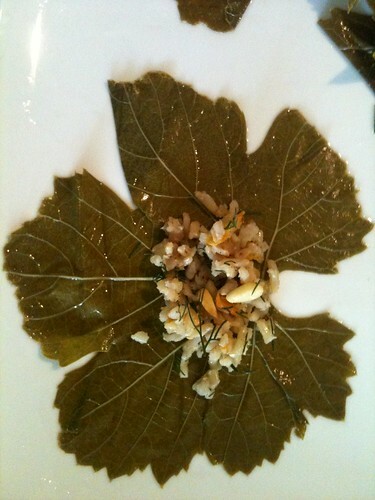 Picking the leaves and arranging them in orderly piles; blanching them in salt water; rolling the fragrant rice, spiked with mint, dill, allspice and pine nuts; their fragrant and quiet simmer in lemon juice and olive oil; and finally, eating the cool and elegant rolled leaves one by one, admiring their exquisitely delicate flavour. A woman who knows how to make these is sure to find a husband quickly. And a man that is patient enough to sit among the chatty women rolling those little pieces of perfections is an unusual sight in this region, but is sure to be the first one to taste the delicious results! If you are up to the task, prepare these a day in advance, as their aroma improved after all the ingredients are in each other presence over night. If you are not fortunate enough to have a grapevine in your yard, you can substitute the leaves with preserved leaves, which are widely found in most Middle Eastern and Greek specialty stores. 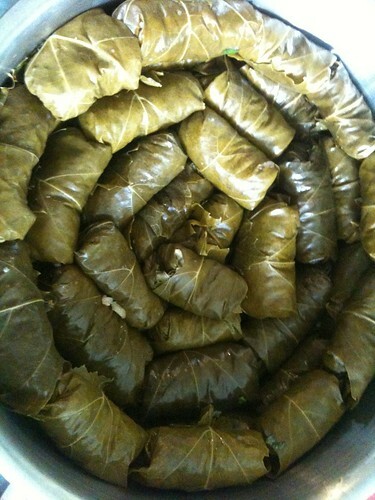 The pickled leaves are usually more crunchy as they are made of more mature leaves and have more fiber. In a large pot, saute the onions in the olive oil until slightly golden. Add the carrots and stir constantly. Strain the rice and add more oil to the pot if needed. Saute the drained rice along with the onions and carrots, for about 5 minutes, while constantly stirring to avoid scorching. Add the raisins and boiling water and cook on high heat until water reaches boil. Reduce to low heat, and let simmer until water is only at the bottom. Turn off the heat, and leave covered for 15-20 minutes, until rice has absorbed all the water. 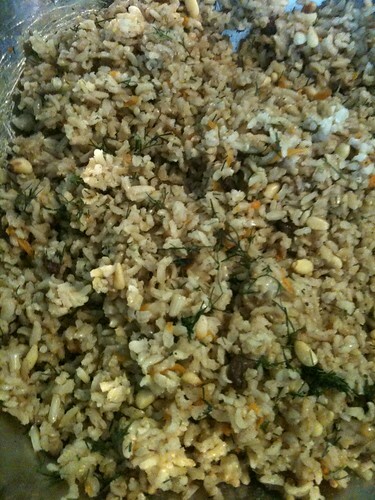 Toast the pine nuts in a pan, and add the pine nuts and chopped herbs to the rice and mix well. Transfer to a big bowl and wait until it’s cool enough to work with your hands and stuff the leaves. Pick as many leaves as you can – 150-200 leaves should be a good start, and if you need more you can pick more later. Pick only the largest of the youngest (which are also the softest) leaves, and keep the stems on (the stems will not be removed until just before stuffing the leaves). One jar of leaves would be enough if you are not picking your own leaves. Arrange the leaves in piles of 10 leaves each, so that you can easily count them. Boil a pot full of water with one tablespoon salt. Blanch the leaves until they change their colour from bright green to olive (at this point they will look as if they were pickled). With a small pairing knife, remove the stem of each leaf before stuffing. Place a teaspoon of rice int eh middle of the leaf, and fold the sides of the leaf starting from the top and the sides (next to the stem), and then roll to the bottom. Be sure not to over stuff, in order to achieve an elegant, elongated shape of each stuffed leaf. Place the leaves in a pot, arrange them in circles and layers, and make sure they are sitting tight and close to each other. Add 1⁄2 cup water, lemon juice of one large lemon and three tablespoons of olive oil. Place a ceramic plate large enough to cover the leaves but small enough to fit into the pot (as to keep the leaves and place so that they don’t open during the cooking). Simmer in low heat for 30-45 minutes, until all the water is evaporated. If there is an excess of water after 45 minutes, gently pour it out. Wait until the leaves cooled a bit, transfer into trays and serving plate and enjoy! These can be served warm or cold, and are an excellent appetizer, but can also make a main dish – especially if you make a huge amount of stuffing and prepare other vegetables. My favourites stuffed vegetables are cabbage leaves, onions, tomatoes, peppers and zucchinis. I prefer to serve them with tomato sauce, and bake them in the oven with the sauce, or with olive oil and than pour the sauce over just before serving. Spring is the season of green almonds. While the shells are not yet hard and dry, and the nut (the actual almond – the “seed”) is not yet ripe. The whole fruit is eaten as is, or with salt. Are you surprised to find out that it is sour? Wait until you reach the interior of this peculiar fruit – the almond is soft and jelly like, and has a very peculiar yet delicate texture and flavour. I am yet get converted to eating almonds at this state, despite the fact that my family adores them (I got a good example of watching my parents eat them as a child, as if it was the most delicious thing in the world). I prefer to wait until May, when the peel is still green, but the interior almonds have started to ripen. The almonds inside are by than crunchy and slippery white. Or better yet, wait until June, when the almond actually start tasting like almond – milky yet not as dry is the almond nuts, much like fresh blanched almonds. Yum! (At this point the green outer peel starts to peel off and the a soft white shell starts to develop). Za’atar is one of the fundamental condiments of the Middle East. It is used to accompany breads and cheeses, and is often mixed with olive oil prior to serving. Pictured are Pita baked while topped with a mixture of za’atar and olive oil. These are irresistible, especially when hot! The za’atar and olive oil mixture can also be used as a dip, or to top off Labaneh – the infamous strained yogurt cheese, which is one of the most delicious things on earth – tangy and refreshing, thicker and creamier than yogurt, but much less fat than the cream cheese that is so over used in North America. To make your own za’atar, you will need to pick your own za’atar leaves – which is actually a species of hyssop, and very similar in flavour to oregano, but more delicate. To that, add sumac and toasted brown sesame seeds, and that’s it! Some also use thyme, but it is not necessary (especially because there is so little thyme growing on the mountains…). The sumac is the red fruit of a wild bush, but is widely available in the spice section of many stores. It has a very unique flavour – extremely sour and salty at once. It can be also used to make a strange cooling lemonade-type drink in hot days. In most pre-made za’atar mixtures you buy in the stores, though, it is sadly substituted with red food colouring and citric acid (which is also salty and sour at once, but in a very harsh and non-authentic way). Za’atar powder is also served with these legendary huge Arab bagels sold at every corner of Ancient Jerusalem. They were used to be sold with hard boiled egg, but now it is more common to have a side of a large falafel patty, which I find innacceptably wrong. It must have been some tourist’ idea, as this is not the traditional way to serve neither bagel nor falafel! fava beans, originally uploaded by Catbus. As a perfumer, there are not very many scents that I don’t like. But if you asked me what is my most hated scent on earth, I would answer with no hesitation – green fava beans! The uncooked fresh green fava beans, as well as the whole plant, has a very green yet sickening aroma. 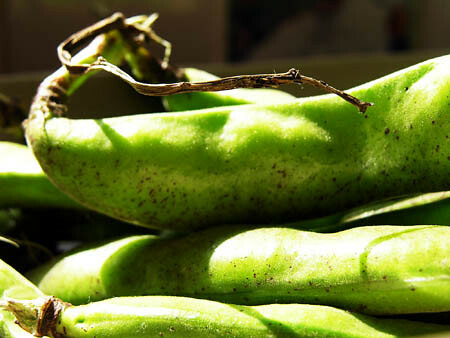 In fact, it is mildly poisonous to eat fresh peels of green fava beans. But once they are cooked, they can make an exotic and unusual dish – much like the lovely and crisp green beans can. They are a delicatessen with tomato and red pepper sauce. If you make your green beans with tomato sauce, try to make them with green fava beans and you will be happily surprised by its flavour and texture. One of my new discoveries during my trip to Israel was Le Parfum de Thérèse, which I enjoyed on those hot dry spring days when the wind from the desert blows steadily and hydration is a question of sanity, not just simple survival necessity. Le Parfum de Thérèse is both fluid and stable. Slippery like a cool veil of satin, moist and refreshing like a film of cucumber and aloe vera gel on a sun-warmed skin verging on a burn. Yet it breathes out coolness like a stone-house in the summer, and has the dry sensuality of a marble rock. It is so utterly Mediterranean and is most magical when worn on a hot and dry desert day – than its true beauty glimmers and shines. With sparkling top notes of basil, lemon, melon and peach, Le Parfum de Therese was revolutionary for its time and preceded the watery trend of the 1990’s by a few impressive decades (and also is far superior in my opinion to any of those). The hedionic jasmine heart is sheer and uplifting, and creates a unique feeling of reviving euphoria. Some of the rose heart notes remain until the very dry down, which is a simple and gorgeous chypre accord of oakmoss and labdanum. Le Parfum de Thérèse shares a lot of its charm with the more widely available Diorella, only is somewhat deeper and more complex in my opinion. Though I barely notice any of the plum and leather notes that it shares with Femme (another great creation of Roudniska), it has a similar sensuality and warmth that is softly captivating and sensual. Le Parfum de Thérèse reminds me of all that is summer – folding the tart grapevine leaves stuffed with rice and spearmint on a marble-tiled patio and the scent of laundry drying fast in the desert wind, and enjoying the coolness of fragrant melons in the evening. One of my missions for this visit was the harvest and tincturing of the thorny bushes that account for the most intoxicating fragrance of spring in my village. The yellow flowers of a variety from the family of broom – only much more thorny. In Hebrew it is called Kidah Seirah. The thorns are sharp and evil and can be likened to small poisonous swords and may cause quite some pain for a while for those unfortunate enough to be wounded by them. The flowers, however, are heavenly smelling – with a scent reminiscent of sweet peas and sunshine. When the peak of the blossoming season arrives, it is almost dangerous to walk outside without becoming intoxicated by their sweet and ethereal aroma. It was my dream to be able to extract and even a little bit of spring in my visit, but I was not able to make it true. When it comes to tincturing, I am quite the novice and am yet to feel successful with the results. After an elaborate harvesting process with my devoted assistant, and waiting for over a week to mature, the result is not quite satisfying. Once the blast of alcohol brashly escapes the vessel, I am left with a sweet, honeyed yet sickening aroma that is not floral, but rather – reminiscent of propollis. Medicinal and not quite what I would call pleasant, not to mention inspiring or spring-like. I have left the jar behind, and took with me the renewed memory of the dangerous beauty of spring blossoms, and a few pictures to share with you. The first one being the bushes in their natural rocky hills environment. I am quite convinced that the absolute of these flowers would have been incredible. But given the challenge of picking the flowers, despite their abundance, it would not be very realistic to keep such an operation for an extended period of time. It was fun though! Spending almost a week at the highly fragrant countryside where I grew up was, as expected, thought provoking in a way that may make one question what they do for living. The fragrance in the air did not originate in the perfumes I was wearing – in fact, I hardly wore any fragrances in my visit there. When one is surrounded by myriads of species of wild flowers, herbs and shrubs in full bloom, wearing perfume will be missing the whole point: the abundance and variety of beauty that nature has to offer at this time of year. Once again, my suspicion that I became a perfumer to compensate for the lack of fragrance in the city I have recently chosen to make my home, was given an extra boost. Do I need to choose between the two? Apparently yes. I need to choose between living in a highly fragrant, unpredictable and ever-changing scent environment; and between living in an odorless town in the other end of the world, and surround myself with artificially made perfumes extracted from flowers from all over the planet where I decide, for the most part, what I smell at any given point during the day or the year. One is the origin, the inspiration, a memory carved in my heart and etched upon my olfactory existence with powerful spells. The other is an asylum, an emotional lab and an art studio where I can create and fill in the gaps. One environment is too powerful to create in. It would be just like carving a sculpture of your lover in the middle of making love. The other provides the space and perspective for putting my thoughts together communicating myself. The predictability and the control that is possible there is strangely peaceful and calm. Photograph: Beautiful and odorless pomegranate flowers from my orchard in Clil. To all the millions of readers of my humble SmellyBlog, Happy Spring Holidays - whether if you are celebrating Passover, Easter or any other holiday, may it be wonderful and peaceful and grand. I will be going away for the next week for my annual pilgrimage to the primitive village where I grew up and harvesting thorny bushes and enjoying the spring flowers which I haven’t seen for seven years. I will be away from any decent internet connection (my sophisticated, snobby laptop doesn’t do dial-up). I sure will miss you all, but I will be back soon with interesting fragrant stories, musings and reports. In the meantime, don't forget the Scented Ribbon Contest! By the time I am back I excpect my mailbox to be full of fabulous photos of the creative uses you found for all those scented ribbons you found in your house during spring cleaning! The fumes of frankincense reached out to the square before the church, and impregnate the walls and the rocks within. My soul is instantly hypnotized by the smoke – thick yet pure. Despite its richness, inhaling olibanum smoke feels like clearing your lungs. It is known for its powerful influence and its ability to assist in reaching a meditative state of mind. It immediately connects to one’s soul, startling at first like a reminder of one’s deeper self and aspiration, yet soothing, deep and powerfully transformative in a strangely balanced way. I almost got lost forever between the chants of the Koptic priests and the Latin hymns of the Catholic monks accompanied by the dramatic multitude of organ. Although the Jewish people followed the footsteps of the Egyptians in the art of using incense for holy rituals and communions with God, ever since the ruin of the second temple, most incense burning practices were abandoned. Qetoret, the holy incense of the temple was composed of resins and spices, including olibanum, myrrh, balsam, onycha, cassia, saffron, costus, cinnamon and other aromatic barks. It is strictly forbidden from any other use but inside the temple. Therefore, synagogues are for the most part deprived from the extreme psycho-spiritual satisfaction that results from prolonged inhalation of olibanum fumes or any other incense in most Jewish communities (left for the scent of citron and myrtle in Sukkot and sprigs of fresh herbs that may be used for blessing on Sabbath in some cultures). Frankincense oil does not have the same powdery, desert-dust-like quality of the resin tears. Rather, it is balsamic, fresh, with some citrus reminiscence. But recently I came across a CO2 extraction of wild frankincense that is rich and intensely similar to the incense. I am very curious to see how much of those qualities will remain after including this oil in a formula. If I am to succeed, I will be lost forever between the chants of the Koptic priests and the Latin hymns of the Catholic monks accompanied by the dramatic multitude of organ. I always hear of these when I lived here but this is the first time I saw them. Photographed April 8th 2006 by my brother, Yotam Dahan. A couple of years ago Paloma, a fine lady from the Perfume Addicts forum, sent me a gift of a lifetime: about 30 or so samples of rare vintage perfumes. To her this corner is dedicated, and I am hoping to be able to live up to the challenge of decoding the mysteries of these antique beauties. Finding vintage Chypre by Coty at the midst of the stash was a dream come true. My unconditional love for chypres is infamous. My most favourite perfumes of all are chypres – Mitsouko, Vol de Nuit, Femme, Miss Dior… In fact, I love composing Chypres just as much as I love wearing them. The basic materials for Chypre compositions rely heavily on naturals (some of them restricted or even banned), including oakmoss, bergamot, patchouli, and my love of all times (yes, since skipping on the rocky and thorny hills with wild goats as a 4 year old): Labdanum. The behaviour of these building blocks is nothing shorter than magical. They transform other building blocks into a different realm, and so they do with the soul of the person who wears and smells them. So it is no surprise that I have taken this precious sample with me on my trip. And it is no surprise that a few minutes after wearing this and starting to write my little essay about Chypre, my grandmother came in the door, and told me how wonderful I smell. When I told her what it was, I was soon informed that it was the scent of her departed mother – this and 4711 were the two she always worn. So I can proudly conclude that the love for Chypre runs in my family for the 4th generation – we are devoted to this genre since its very intention, as my great grandmother must have been a young lady when it was launched. But my chypre bias put aside, smelling Chypre after digging through the stash, and more so, wearing it on my skin, is akin to searching for treasures in my grandmother’s treasure box she kept for us on a high shelf as children. Besides a stuffed lioness and a white seal which she kept from my baby-days, it was full of fancy fake jewelry and exotic beaded necklaces made of dyed tropical seeds and carved wood. Along with a couple of empty perfume bottles, this was sure to occupy me for hours. One of the empty flacons was Judith Miller’s signature scent, in a Biblical-inspired swirled-brownish gold glass bottle with a long neck. Altogether, this smelled like Coty’s Chypre which rests on my wrist this very moment. There is something mysterious and delicate and muted about vintage scents. They are never cloying, and the scents are so well married to one another after years of living together in the same bottle, that it is far more difficult than before to discern the notes from one another. To begin with, Chypres possess the phenomenal quality of sucking in all the notes and transforming them in such a way that they are highly disguised and hardly separated from one another. This is due to the unusual characteristics of both oakmoss and labdanum. In vintage Chypre, the sharpness of sage calms down after marrying for years with jasmine, roses, oakmoss, labdanum, patchouli and bergamot. There is something magical about sage that makes it soft and plump as a peach after it has been fully matured surrounded by those elements. Although bergamot is known for its importance in Chypre compositions, and this is what made Chypre the special and groundbreaking perfume it is – do not expect to find a citrus bergamot top note in this perfume. The bergamot serves as a counterpart to the mossy and earthy base, only to complement its sweetness and uplift the deep base notes. The top notes are more aldehydic than anything else. Chypre possesses the old fashioned softness that became the trademark of many a French perfumes to come. If Chypre is not the first chypre composition you ever smelled, you will probably not be knocked off your feet. But dlest we forget: this IS the first one. And that is where the genius of Chypre lies. Without it there would be no Mitsouko, Femme, Vol de Nuit, Miss Dior, Eau Sauvage, Le Parfum de Therese, Chant d’Aromes, Ma Griffe, Jolie Madam, Cuir de Russie, Private Collection, Paloma Picasso, No. 19, Christal, and the list goes on and on. Chypre is perhaps the single most versatile fragrance family that there is. Upon application, Chypre is a gentle yet powderful aldehydic floral with hints of green sage and thyme. It softens to reveal a floral and somewhat soapy heart of jasmine and rose and a warmth of spice that is very subdued (only warmth, no sharpness). The quiet and persistent waves of oakmoss and labdanum gradually wash the shores with a sweet mossy earthiness that is only slightly honeyed and animalistic. As it softens further, it becomes more woody with a hint of well aged patchouli which never overpowers this balanced garden of Mediterranean aromas refined to become the definition of classic French perfumery. Celeditude, originally uploaded by Ed Shepp's Blastonautical Adventures. I haven’t been in my country in the spring for seven years, and for that matter, for all I care for, I had experienced no spring for those full seven years. If there was no other reason for me to have that trip, this would be a good enough justification after many hours of air travel. No orange absolute, or even as a wonderful an orange blossom scent as that of Monsieur Lutens would live up to the challenge. They can only scrape the surface of the beauty of the scent that orchards in bloom exude in this time of year. The closest thing, maybe, is the legendary neroli hydrosol I recently received a sample of from Chris, and needless to say more is on its way. Little did I know that despite the accurate directions from my precision-loving grandmother, the young taxi driver had no idea whatsoever how to bring me to her home. We wondered to strange suburbs and little villages around the airport and near Tel Aviv, but despite the desperation to end my three days journey across the continents (and go to pee, for heavens’ sake! ), the hope that we will go next to another citrus orchard and get a whiff of this heavenly scent made the trip not only bearable but in fact even thrilling. If you ever happen to land here in the spring, take a ride with this driver. 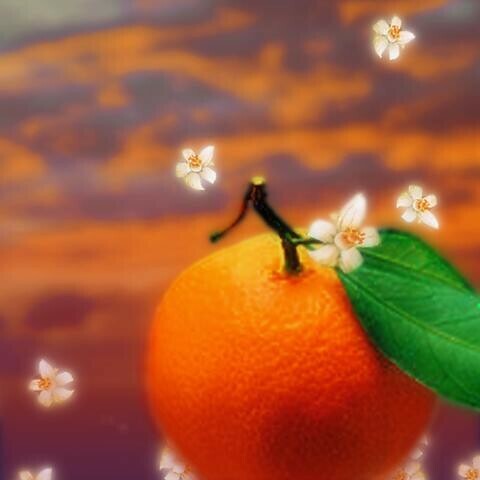 You won’t make it to your destination on time, but you will smell lots of orange blossoms on the way. His license number is 64-052-25. There is nothing more hillarious than finding a thrilling adventure in the midst of the most mundane place of all. And what is better than perfumes to make the adventrue of my day? The following posts will have very few words and lots of images of fake perfumes that I found today at the mysterious and evokative "souk" in Tel-Aviv (known to locals that are less mystified by any Middle Eastern stinky outdoor markets where they buy fabulous fresh produce as well as miscellenius goods as "Shouk ha-Carmel"). I think the images speak for themselves, so my impressions will be short and I am afraid relate to the bottles rather than the scents (I only tried two). It all started when I spotted this one. I recently got interested in it after finally trying on my skin in Heathrow. It was beatiful and similar to Parfum Sacre to my surprise. So when I saw this smell and look alike in the market, I was hoping for a cheap thrill. It smells slightly of KenzoFlower for a moment, but does not go beyond to display the richness and loveliness of KenzoFlower. It is cheap in the worst way imaginable. And can't even claim to be original either. Not bad imitation of packaging though, one must admit. I must admit the exclamation mark was terribly missed. I just had to add it.